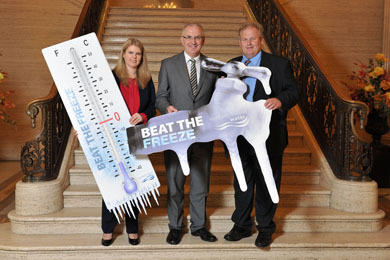 DRD MInister Danny Kennedy, centre, helps promote the winter farm protection from burst pipes. NI Water and UFU are renewing their call to farmers to consider now the impact of a burst pipe this winter and to protect their farm. Following on from the successful, ‘Two Step Pipe Check’ campaign of 2012, the new message reinforces the call to check that your farm is prepared for the cold weather conditions winter will bring. Brian McCalmont, Head of Leakage at NI Water, said: “Over 60% of NI Water’s non-domestic customers are classified as farms, so it is an important consumer group for us. Farms can also be among our most vulnerable group if they lose their water supply. “The effects of dealing with the aftermath of a burst pipe on a farm cannot be underestimated. Water is the single most important requirement for livestock. On a dairy farm, livestock drinking water accounts for between 50% and 75% of the farm’s water usage. It is therefore vital farmers have a clean constant supply of water. Know where your stop valves are located; why not put one of NI Water’s new stop valve tags on them, you can request these by phoning Waterline 08457 440088. Where practical ensure all underground pipes are buried 750 millimetres (2½ feet) below ground level. Write down the name and contact details of a SNIPEF (Scotland & Northern Ireland Plumbing Employers Federation) registered plumber in case a pipe does burst. UFU President Harry Sinclair said: “The UFU welcomes the opportunity to work with NI Water this year again to help prepare farmers for the winter ahead. In 2010 we experienced some of the worst weather we had seen for decades and many farmers found themselves without water, facing extremely difficult circumstances. NI Water has also provided UFU with stop valve tags and thermometers that will be distributed to local UFU offices. Farmers can use the brightly coloured tags to mark stop valves in the fields or in sheds. By putting the tags on, it can help to remind them where the stop valves are on their farm and the bright colour of the tag will serve as a useful marker in future when they are looking for particular stop valves again.